Many people have reasons why they want to go where they travel to. They have read about it, they have talked to friends about great travel locations, or have some type of valid reasoning of why they want to go somewhere in the world. That is not me. I have done much of my traveling by finding a cheap ticket, booking the ticket, then researching the location afterward. Once I find the ticket then I find all the amazing reasons why I should go to this place which I already have a ticket for. Backward I know, but it allows me to go to places I would have never thought about going to. My $188 ticket to Chile opened my eyes to South America and started my forage in the countries on that continent. My cheap ticket and three day trip to Istanbul was truly amazing and I am saddened by the restrictions on tourism because it is such an amazing city. The city is vibrant with color, smells, tastes, personality, and landmarks. It is a city which I could go get lost in again and find completely new places! I felt safe walking around, both in the light and in the dark. I walked miles and miles around the city and at times looked like the lost tourist, but people were nice enough to help me out! The train system was great and very easy to use. I found a great, cheap, comfortable, centrally located hostel called #bunktakism. It was within walking distance of the metro. I felt safe walking around the area. The bunkbeds were nice and comfortable. Lastly, it has a very cheap breakfast buffet which allowed you to eat while taking in gorgeous views. It had an awesome rooftop where breakfast was eaten and at night it turned into a little lounge with a bar and a DJ spinning on the ones and twos. I used a cab to get to and from the airport because I had to travel late at night and did not want to attempt to use local transportation when I couldn’t get a lay of the land. Once I arrived at my hostel and was able to sit down with a map, the metro was the only method I used to get around after that. You can take the metro from the airport to the city center now, but I don’t believe the ability to do that this three years ago. The metro was great. It was cheap, easy to use, went to everywhere I wanted to go, and the trains felt safe. I didn’t feel the need to worry like when I am on a New York subway. But that does not mean I wasn’t aware of my surroundings, where my items were, how close to me people were, and so on. Just because it feels clean and safe does not mean I did not stay alert. But this was a metro that was comfortable to ride and I would suggest this method of transportation to all who go to Istanbul. Below is a metro map to get an idea of where the metro goes to. Below is the cost of tickets for the metro from Turkey Travel Planner. 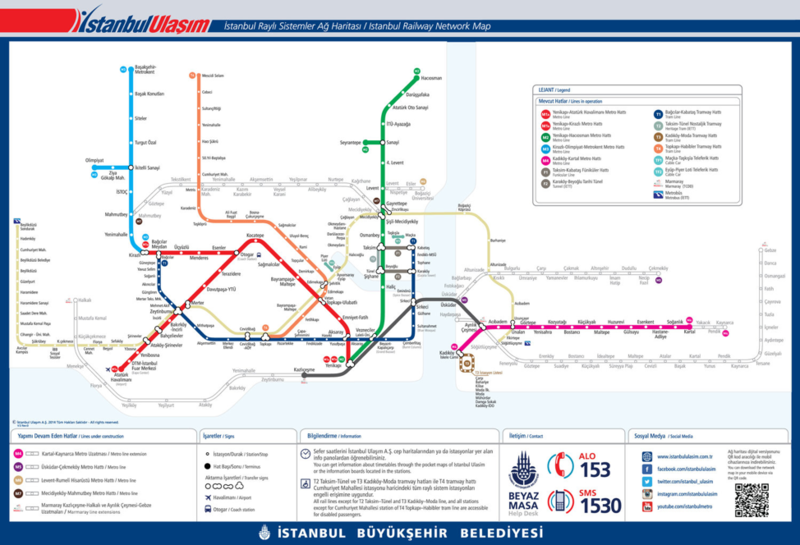 City bus, Metro, tram, funicular, Tünel, ferry: TL 5.00 (with Istanbulkart: TL 2.60); transfer to another vehicle: TL 1.85. These are the fares for most short rides on most means of transport (Metro, bus, tram, funicular, ferryboat). Longer or special journeys may require higher fares. İstanbulkart: A plastic RFID chip card that you purchase, load money onto it, then use it to pay transit fares, the Istanbulkart is the cheapest and most convenient way to travel on public transit in Istanbul. Jeton (Token): You buy single-fare tokens at Jetonmatik machines or snack/newspaper kiosks in or near busy Istanbul Metro stations, bus stops and ferry docks. Eminönü is a good place to look. Once you get the transportation down everything else is a breeze! I really stuck to eating street food and drinking as much fresh orange juice. The street food was cheap and delicious. Also, get used to drinking Turkish tea everywhere you go in Istanbul, you get addicted to it. Walter Coffee Roastery: This is a Breaking Bad themed cafe which seems to have mixed reviews on TripAdvisor. I, unfortunately, did not know about this place until after I left, but I would have loved to have visited it. Istanbul had so many sites to go see. 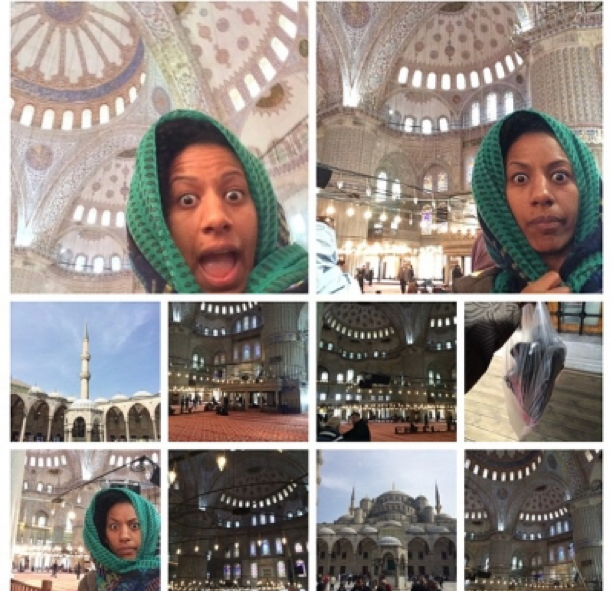 I was in Istanbul for three days and I truly could have been there longer, because there is so much to see and do. This was a great city to visit andI hope others get the opportunity to see the great sites within the city. Asian Istanbul/European Istanbul: Istanbul is the only place in the world that has its city in two continents! How crazy is that? You can literally say you have been in the same city in two continents! Because of that, you must go. It is a quick jaunt over to Asia. If you want information about on details of how to cross, how much it costs (really cheap), and what do to over there please take a look at this blog. I didn’t think there was much to do over in Asia, it is definitely a lot less touristy than inEurope. But anywho- do it. Basilica Cistern: $5 US for adults and children over 8. As Lonely planet says This subterranean structure was commissioned by Emperor Justinian and built in 532.The largest surviving Byzantine cistern in İstanbul, it was constructed using 336 columns, many of which were salvaged from ruined temples and feature fine carved capitals. Its symmetry and sheer grandeur of conception are quite breathtaking, and its cavernous depths make a great retreat on summer days.This is a must to go to because of gorgeous the structure inside is. There is an eeriness to it. 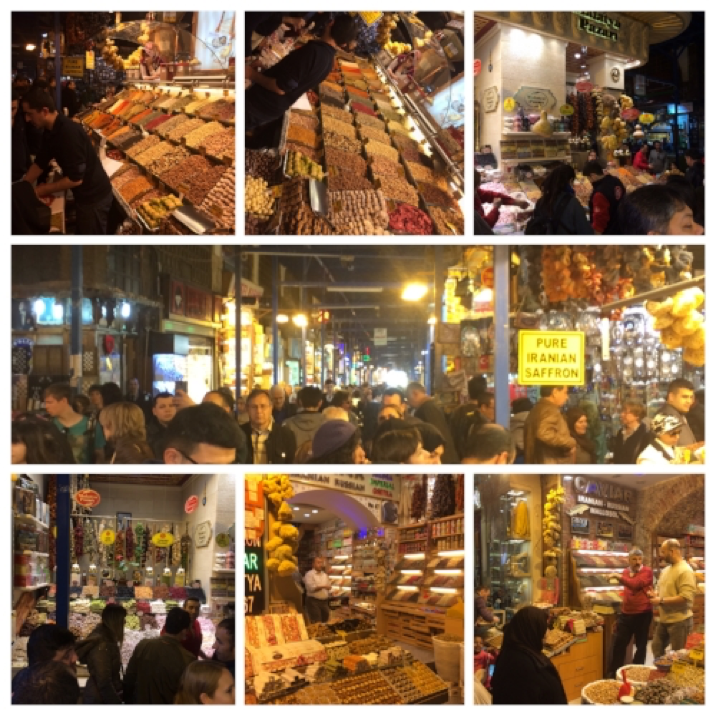 Grand Bazaar: Words can’t express how awesome this place is. You know you are in the right area when the sights and sounds assault you. This is the type of place you can wander around for along time. You can get your normal tourist trinkets for a cheap price, and her cool random Turkish items, but you must bargain. Be ready to bargain each time you want something. You cannot pay the first price they give you, for all tourists everywhere- don’t do it!!! They start crazy high and want you to bargain them down. Every time it is a game you are both playing. Hippodrome of Constantinople: The arena that was used in the past for chariot racing. Is a great place for photo ops. This is in the Sultanahmet Square and close to Agia Sophia Church and Blue Mosque. Prince Islands: You will take a ferry to get to these islands. I can’t remember the name of the island I went to but it was gorgeous with only horse-drawn carriages and bicycles. I wish I was able to go to around the island when the sun was out because the views only get better and the sun makes the island shine. This guide gives you the ferry schedule from Kabatas (where Istanbul is) to the Prince Islands. The writer also gives a detailed description of the other islands you can go to in the vicinity. 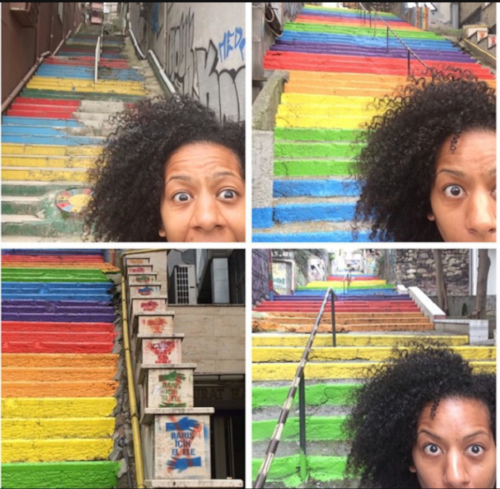 Rainbow Stairs: This is a decently well know photo op place you have to go. It is very easy to get to on the train, and a few blocks away the train station you will get off at. Take a look at this website because it will give you a little more insight on the stairs. Spice Bazaar: This was probably my favorite place. The smells literally come out and steal you. The spices are the best- buy as much as you can. I bought a huge bag of fresh rosemary for about $5. That size would go for $50 or more in the states. They have all types of saffron, it is the real deal and it is expensive. I bought some for a friend and the small amounts totaling $80 would last him for a longtime. If you love the Turkish Delights sweets then buy them here. Sultanahmet Square: Hasboth the Agia Sophia Church and Blue Mosque. The area is huge and is brimming with people. A very enjoyable location with all the food, easy train access, and enjoyable chaos. Make sure you have a scarf on hand to wrap around your head if you are a woman. Topkapi Palace- About $11 US. It is a museum where the Sultan used to live. Be aware that there could possibly be long lines, and depending on when you go there can be a lot of school kids. It is worth to go into to see the relics of the past Ottman Empire. 1. Turkey uses the 220 voltage so make sure to bring your adapter. 2. Bring a scarf to cover your head if need be, also check the sites you want to see in case they require your legs are covered.